Re: meaningless freezingseason/melting season chatter. The roads are generally dry in Iqaluit, and have been pretty much all month. The tundra is increasingly peering out. It's been generally sunny all month; the only cloudy period recently was Tuesday night/Wednesday morning. The river is starting to flow a bit more, so it's flowing above its frozen cap (not enough room underneath the ice for all the volume). "due to underlying physics" just to suggest a candidate. If the ice is too weak to suppress wave action then it will break up more and sooner, then it's surface area increases by orders of magnitude. Instead of a maelstrom of currents and counter currents suppressing tidal action tides will penetrate further and with them more, mainly, atlantic waters will penetrate deeper into the basins disturbing the deeper layers. It looks like this has established in Barents and there are hints of it, though there may be better explanations, over by Banks island/Amundsen gulf/Beaufort. I think he's wrong in his last sentence. I think at the end of the century when you look down on the Arctic from above you will see a land of perpetual fog, summer -- and winter. If the ice is too weak to suppress wave action then it will break up more and sooner, then it's surface area increases by orders of magnitude. I think orders of magnitude is a bit of an exaggeration. 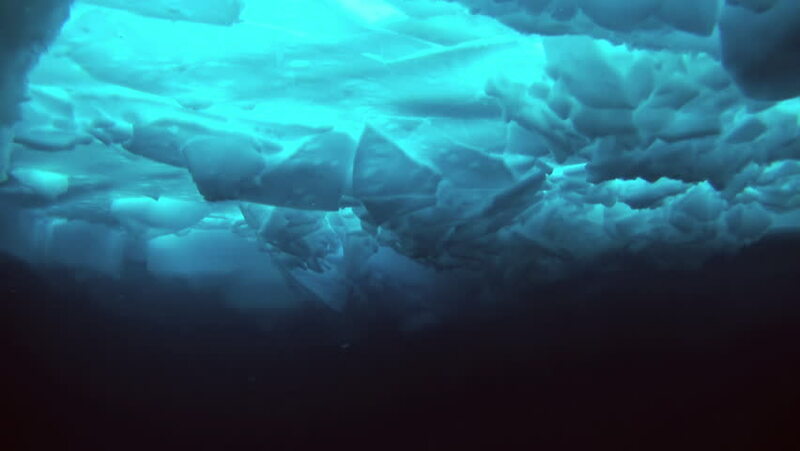 Sea Ice has dimensions roughly equivalent to those of a sheet of paper. Tearing up a sheet of paper doesn't significantly increase the surface area. However your point that wave action and heat from the sea will make ice formation more difficult appears to be valid. The Hudson and Okhotsk remind us that under the right conditions sea ice can form at very low latitudes. Barents and Greenland remind us that the reverse is also true, with other conditions ice will not form at high altitudes. I sometimes wonder if the last remaining summer ice will be in the Canadian Archipelago. You don't see that on any other oceans. The land will be foggy. Iqaluit is already switching to a marine climate in summer, which means much higher precipitation (starting from very little, it doesn't take much to get a big percentage increase). And more fog. And summer temperatures not really increasing locally. 'orders of magnitude' the sheet of paper analogy doesn't really work, if the ice is .5-1m thick and in sheets several km2 then once that sheet shatters many of the remnants will flip to near vertical, i can't imagine that with paper but with ice it's almost inevitable. I think. Don't see how ice floes can flip to near vertical. Doesn't seem very likely. I agree that thin ice will fragment, but those fragments will not increase the net ice thickness unless force is applied through compression. Absent that, unless either gravity changed or a surface dimension changed such that it is less than thickness, fragments are not going to flip. Don't be a fool. Life rafts, planks and similar flat objects are well known for floating edge-on. It's also well known that when they do so, they cover more of the water's surface rather than less. I like being a fool - so here goes. Compaction creates pressure ridges where floes can be piled up and squashed and stuck together randomly. I guess they would be more difficult to melt than when spread out. Icebergs roll when melting (mostly from below ?) moves their centre of gravity too high or sideways. I would guess that when a big sheet of 1 or 2 metre thick ice breaks up, even a 25 square metre floe would be very stable and unlikely to float narrow edge up. Foolish or not, "That is My Theory and it Belongs to Me". You've been staking claim to a lot of "Theories that Belong to Me". Because there are so many, one of them might be correct, at which point I will tell everyone what an immensely clever person I am, conveniently ignoring all the others that turn out to be - er, crap. i think when the prof Barber trip that gave us the 'rotten ice' naming he laos witnessed a swell destroy a multi km floe in 15 mins and all of that ice 'lay down' cover far more ocean than it did as the original floe? I see the final numbers of 08' and 09' contaminated with this 'collapse and spread' of older, multimetre thick floes? Our denier friends were busy claiming 'recovery' , after the low of 07', in 08'/09' but the reality was the continued collapse of the paleocryistic ice cover which then went in the volume plunge of 2010. I think the only way we see thicker ice from breakup is the over slabbing of floes when they run into one another? Officially about 1 week past the Slater Projection. Does anybody know who at Colorado to contact to attempt to rectify this? You phrase it differently, but that actually is what I was getting at, if somewhat clumsily. "The sad, sorry, terrible thing about sarcasm. It's really funny." Bergy bits like to flip, so I'd like to hear him out...though at this point I'm not seeing anything meaningful about it. 'underlying physics' As the ice moves away from the pole it gets left behind by the rotation of the planet, it moves west or if you will clockwise. It doesn't all rotate together so leads open, the closer these are to the center of the ice desert these are the dryer the air and the faster and more solid the ice that forms in any particular lead will be, I suspect the -11c rule doesn't apply here. So the ice sheet expands from it's center, leads open ice forms, gets crushed until the thickness and density vary, for our purposes, infinitely. As the ice rotates it gets 'softened' up passing over the Laptev end of the Eurasian basin then continues to rotate to the area between, but north of, Svalbard and Franz Joseph where the warm Atlantic waters, which flow ccw, have cleared ice from Barents allowing waves to first break up then smash and melt the ice halting the flow of ice through Fram, but also curtailing the rotation of ice into the gap between Greenland and the pole. This has been more or less consistent for the period Oren referred to, towards the end of the melt season, but last year was more extreme. Without that recycling of older ice the whole dynamic is changing. I think. What do you want the Arctic Sea Ice to do? Recover? Reduce? Using JAXA data and telling Excel to fit an X3 trendline to the data, you can have either. The graphs below have the same data - the only difference is the number of days in the time series. Very nice. That will make everyone happy. Hence the title "A Cautionary Tale". Ðö þing hiö wuld bi ðö miiningless chætter, nou? Ái strongli sagzest wi muuv bæk tu gaads ænd gaaddesses. Þænk jüu. I like the exponential fit because it helps to visualize the changepoints in the data. However, they have no predictive capacity unless the system is fully understood. At least everyone is staying perfectly on-topic, for once. I doubt this thread has needed half the moderation of, say, the extent thread. Everyone is their own worst critic, but autists are our only critics. So , if you are like me then finding out that the 'perfect melt storm' synoptic was a thing that returns to the basin every 10 to 20 years will have set a worry cycle each start of melt season " is this a repeat of the 'perfect melt storm'?"? This year ( 11th since 07's mega melt year) is both within the return period but also inside the low solar period that saw the last 3 record breaking melt years of 07',2010 and 2012 ( 2010 was just a volume record). A Trump tweet while OD'd on coca-cola and beautiful chocolate cake ? "I must be idle, or speak to your face"
Thankfully, I was never into conlang. Sadly, my son is. Þænx Sheöd Hjumæniti fo bringing mach niidid riliif tu þis þred. Klingon iz wan of ðö bettö weiz tu distrækt piipl. Long Lív the Klingoniis Empaiö! Sooooooo, how many of us will not be coping well by the end of this melt season if we continue to see what we currently are seeing across the basin? What I'm saying is will a number of us suffer from reactive depression from seeing the ice plummet to a new swathe of record lows ( or worse ,a B.O.E.)? I'm beginning to think that I , for one, will not cope well in seeing my years of warnings about what lies ahead made flesh as I know what must then follow for the circulation of the Northern Hemisphere over Autumn/Winter. Each melt season, since 07', has been roughly similar for me with concerns over what might pass that year. By August , since 2012, those fears have eased as it became apparent we had , again, dodged the bullet. I believe this year is starting differently. I don't know if I have freaked myself out with a link between low solar and high loss years or whether being in the return period for the perfect melt storm has set me off but my thinking has again turned to ''what if it's this year'' and nothing ,so far, has calmed that thinking. So c'mon folks, what is your trick for not going nuts over melt season? The ice sheets are melting. We know that. the only question is how fast. Sea level rise will rise. The only question is the rate of change. Life will become tougher for most life forms. We know that. the only question is how bad will it be. e) Those who presume to govern us are incapable of grasping the nettle. We know that. the only question is how inadequate will they be. f) Some of us did our duty and like Cassandra, told them. g) It is still necessary to continue to bear witness to humanity of what is being done and the consequences of what is being done. One has to accept our individual limitations, and at least do our best to make sure our nearest and dearest understand the nature of things to come and encourage them to have the tools to survive. Thanks Gerontocrat!, I wish I had as strong a belief in the B.O.E. being only a 'small' chance as I have it that any return to the 'perfect melt storm synoptic' would have us sailing very close to such a thing and so, until we fall off any trajectory toward a repeat, I will fret! I get the feeling that the C.A.B. has been doing far worse than the numbers tell us by melt season's end due to the nature of the way we 'capture' extent/area numbers? There is nothing we can do about this discrepancy , apart from ask NSIDC etc to help, if we want to keep on measuring apples against apples but as open water increases in the C.A.B., at season's end, we will keep on believing the basin is holding its own whilst the reality is somewhat different? I just hope that the agencies employing the 15% and 30% cut off system are working on a replacement as we could find ourselves still seeing 100% ice being recorded when the reality is only 16% cover is present? Why does this matter? Well the old " when the end comes it'll occur pretty fast" covers that? There must come a point where the energy in the ocean is enough to melt the runt of the ice in the water ( no matter the weather) so if we are fooling ourselves that there is more ice than is present then we will not see it coming? If we think we are headed for a record low of sub 3 million ( what the numbers are telling us) but the ice in the water is only 40% of that figure then we may well have a volume that is less than the melt momentums 'melt out' potential for the basin that year? I worry that folk over reliant on the numbers, and not on personally 'looking' at the ice condition, could be in for a shock as ice that is measured, but not there, drops below the cut off and ice cover numbers drop like a stone in the " it will come fast" end of a melt season carrying high momentum for melt into those last weeks of melt season? I guess I've answered my own question though and the only way to ease my fears is to keep on watching the ice until I know we are 'safe' for another year? While following individual melt and freeze seasons is fascinating, (especially all of the insights I get here) I don't allow any single season, no matter the end result, influence my mood. My mood is impacted by what is most certainly a long, slow, irreversible demise in our and all living things well being. This troubles me incessantly. I am reminded that the rate of change in distance is speed, the rate of change in speed is acceleration, and the rate of change in acceleration is jerk. I think the important question is how much we are being jerked around. G-W, make an imaginary 100$ bet for a B.O.E, and then rest assured that Murphy's Law will keep the ice safe for another year. Best way to avoid worries as we inch closer and closer to the brink. And when one year it finally happens, at least you were right! It's only stupid psychology but it works for me. 2) Remembering when I went nuts over climate science etc. in the early days of the 21st century. 4) Reading about the Holocaust (incl. the Croatian Holocaust). 6) Keeping a detached cold blooded scientist perspective. We are privileged to witness a crucial turning point in the history of Life (not just the bloody hominins). That does it for me. It may be very worrying but its also amazing and genuinely fascinating to see first hand. Other things: bringing it up in conversation; trying to spread the message (and remembering that you never know how many people end up taking it to heart); energetically trying to align ones own lifestyle with what needs to be done by everybody - low carbon, etc. No doubt you are not alone, GW. Pretty close to 85F here today, using Fahrenheit as this is the meaningless thread.